With over 400 wines featured you can find some of Victoria's greatest treats as well as International gems. 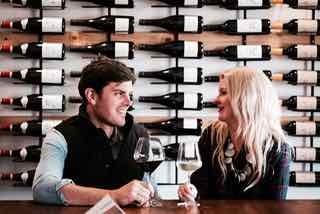 The list has been carefully curated from the unique perspective of a winemaker Owen Latta of Eastern Peake Winery and Latta Vino. After a lifetime of growing up and being a part of this industry, his favourite wines tend to focus on 'minimal intervention' methods of winemaking where the grapes are expressed to identify a special region. Identifying people behind wines that sit outside of the lake of generic brands that are out there is easier than it sounds for Owen, especially as he's grown up with this all his life. We trust Owen to give us a truly unique perspective on who's making amazing wines. Join us on his journey. Sit in and enjoy wines by the glass that rotate as frequently as weekly plus, a full range of vermouth, gin & tonics and apertifs. But the biggest plus about the wine shop/wine bar hybrid model is that you can choose any bottle you like from the list of 500+ on the bottle shop floor and just add $10 to the take-away price to enjoy in the bar. That means you can be drinking the world's most sought after producers for significantly less than you would see these wines elsewhere on restaurant lists. We work hard to secure allocations of the most sought-after wines so it's a rare treat to scour through our bottle shop and find something you've always wanted to try without paying restaurant prices. A great plus for the wine lovers!